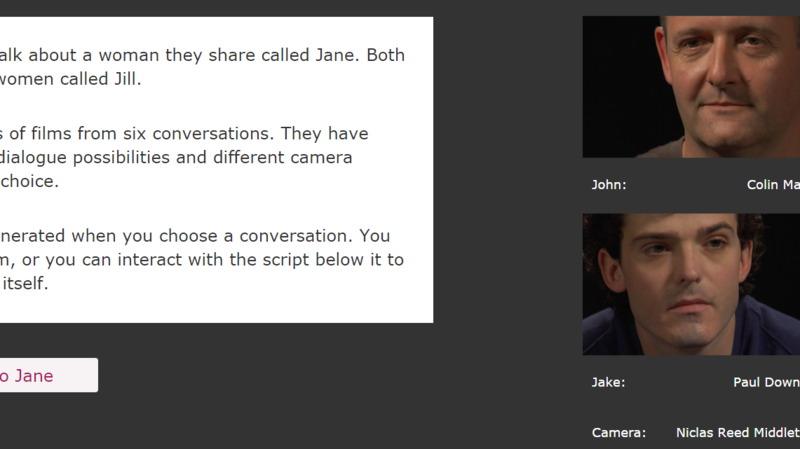 'Jane' is a series of films comprising of six conversations between two men about a woman they share; both are married to a woman called Jill. Each is replete with options for dialogue and camera angles that are initially randomly selected. The work also allows for user selection through navigation of the interactive master script for each selected conversation. Films last between over three minutes to a little over five. Form follows function as the vagaries of desire that the mythical woman Jane embodies finds its perfect expression in the deliberately pliable text. 'Jane' eschews branching narrative. Instead variants that have localized polyvalence propagate semantically across neighbouring content. These maintain credible meaning in each combination of the very many compound possibilities available. Exists on the web but also as an easily installable single screen installation piece. Read the generated script for the random conversation. Play this version in full screen mode. Go out of full screen and change the film by changing the script below the video, change numerous lines and camera angles. Play the conversation again to see the changes you made as a new film. Repeat with a new conversation (menu top-right button) from the 'conversations' right-hand top menu. Ian Flitman is an English new media artist working in algorithmic narrative. His previous work includes Hackney Girl (2003) which was widely exhibited and won the Best Narrative Award at Flash in The Can 2004. It is a self-editing video diary about the artist moving from London to Istanbul in 2002. A road movie and love story, Hackney Girl reconstitutes the act of watching film into an exercise in pattern recognition as viewers compare differently nuanced versions of the same narrative. Later 'The People' in 2010 was shortlisted in Best Sound category in the same festival, and likewise shown. This is a series of films of people listening to the poem ‘The People’ by WB Yeats. Users can choose the number and identity of the listeners, who they listen to, and what background music and sonic atmospherics accompany them. By doing so, it both reflects the central message of the poem and reformulates the film soundtrack itself. In 2016, Ian Flitman released 'Jane' another large series of films, this time from a polyvalent dialogue-driven script for two actors. Meaning follows form as the piece is about the unstable vagaries of human desire. It is also absurdly comic and rather rude. Ian lives in Switzerland. By day, he works at a university there as a computer scientist. By night, he schemes narrative mischief.